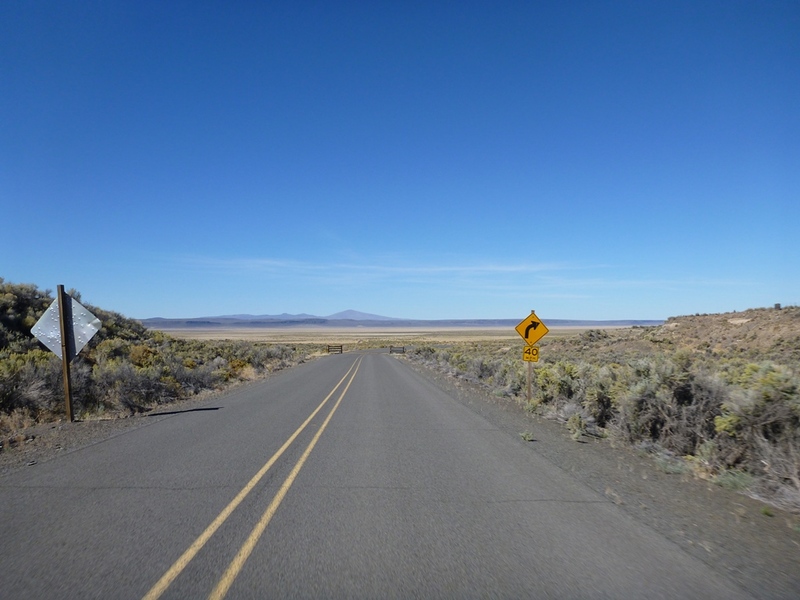 At first glance from the east, along the edge of the Alvord Desert, Steens Mountain appears to burst over a mile into the sky. 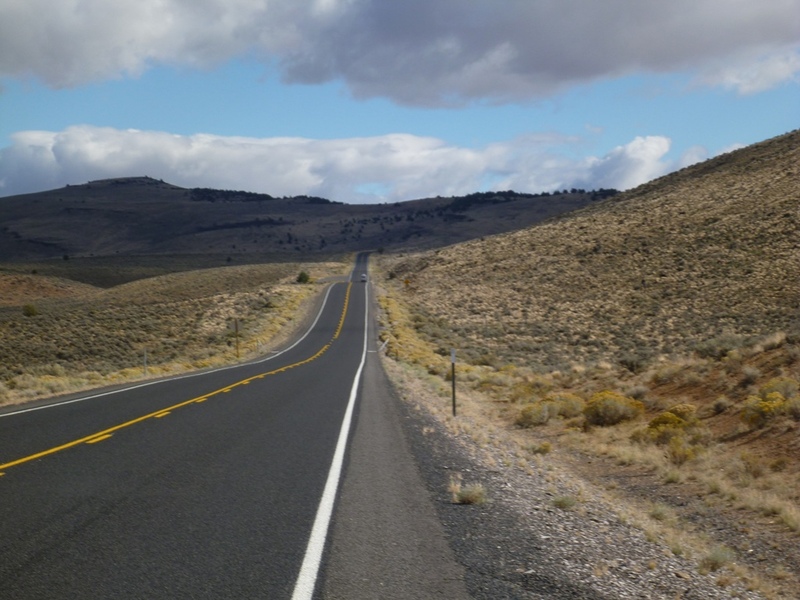 While technically just one mountain, the Steens escarpment stretches over 50 miles north to south. The nearest town for last minute supplies is Burns, OR, just over a five hour drive from home. I decided to drive out Wednesday afternoon and spend the night in Burns, hoping for an early start. 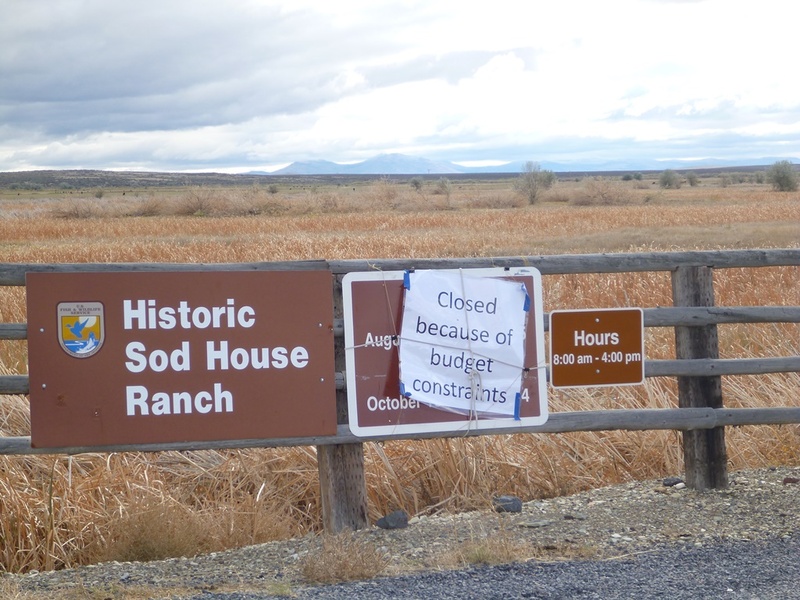 About 30 miles south of Burns is the Malheur National Wildlife Refuge, consisting partly of Malheur and Mud Lakes. OR 205 crosses through these lakes at an area known as The Narrows. At the crossroad heading out to the refuge headquarters is the only business in the area, The Narrows RV Park and store where, for a small daily fee, they kept an eye on my car. Thanks to Linda and Ron, the owners, for providing this service. 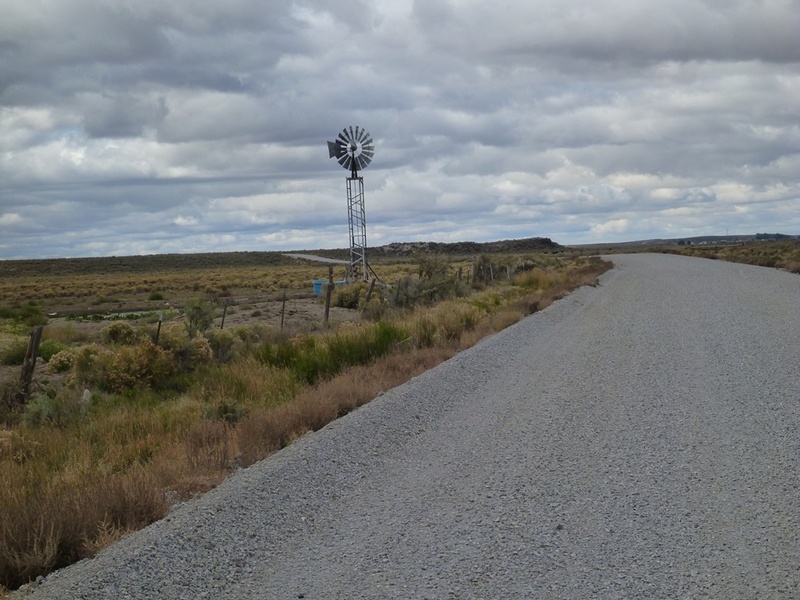 The only other choices for this loop tour would have been to start in Burns or 40 miles south in Frenchglen. 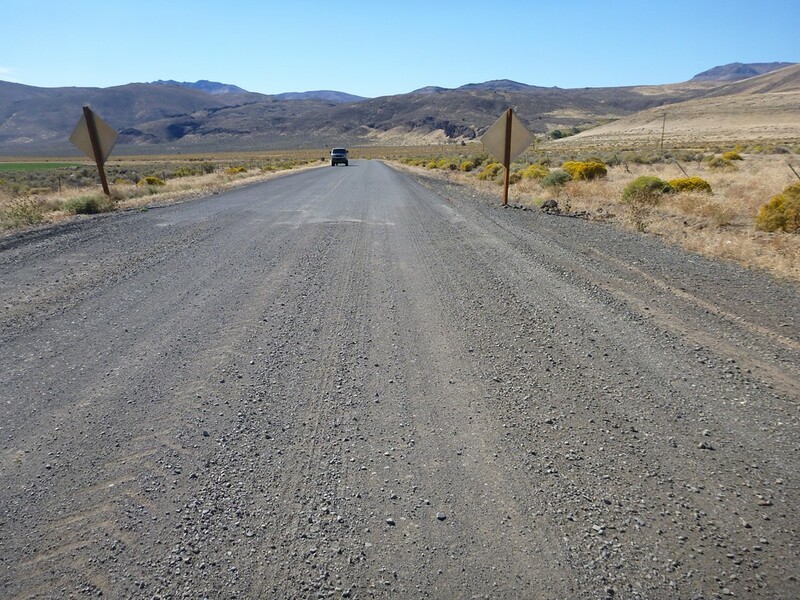 The next 14 miles along Princeton Narrows road were rough gravel and washboard. The wind continued to howl with not a single windbreak to be found. Finally the chipseal returned for the last three miles to OR 78 and time for a snack break…2h 23min to cover 23 miles. 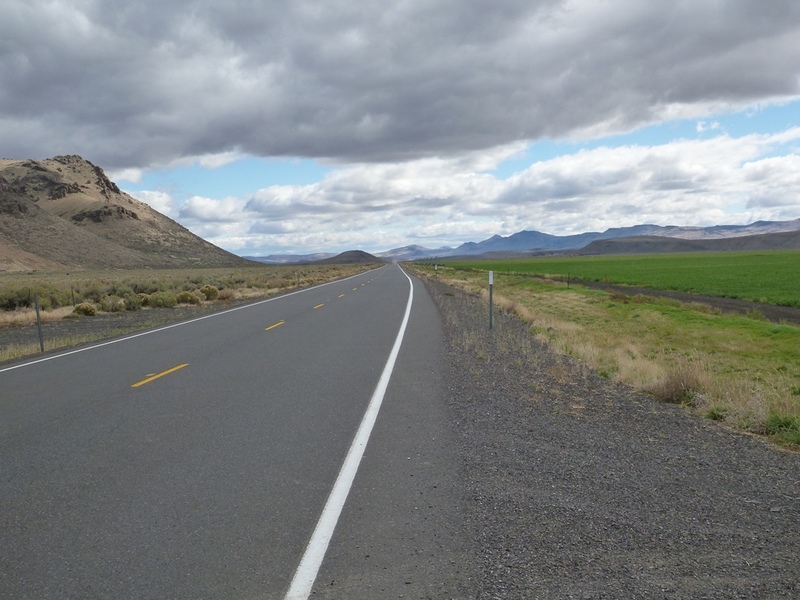 The first 16 miles on OR 78 were a relatively flat, empty, tailwind enabled cruise. 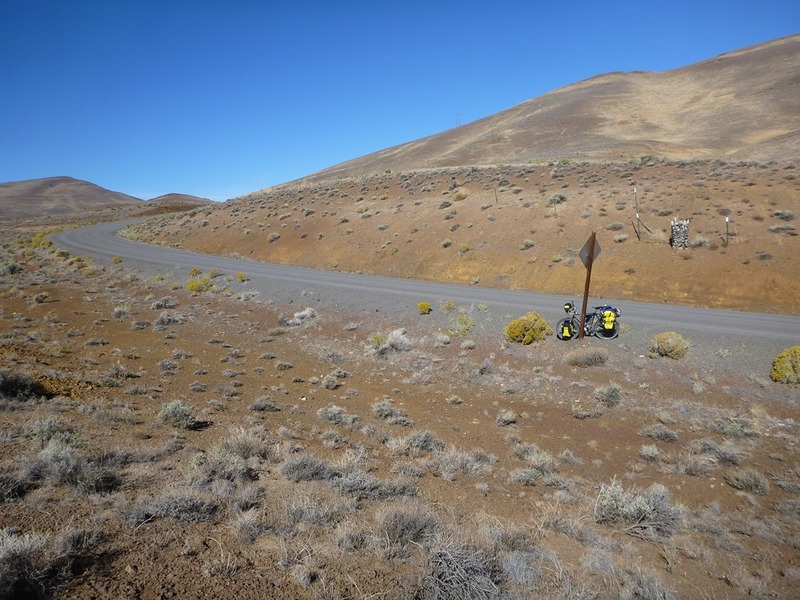 Unlike the west side of the Cascade range, eastern Oregon is all desert. With no stores until the end of the second day and no potable water sources, you must carry whatever water you may need. My solution, a 6L MSR Dromedary bag, may have been more than I needed, but it beats the alternative! 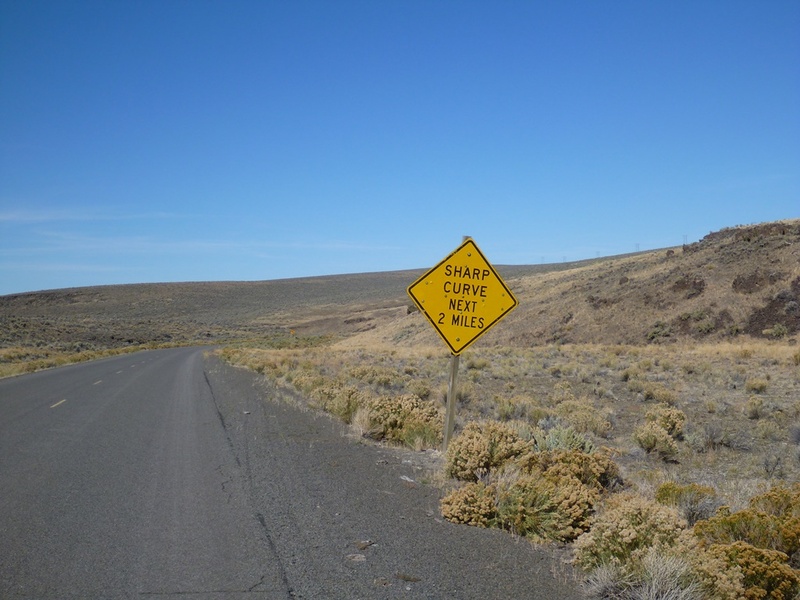 Empty desert highway with a tailwind, time to pass the miles. This was followed by the first climb of the trip, 7 miles and 1000 feet up followed by a 4.5 mile, 800 foot drop, 40+ mph descent! Ready for the climb and actually climbing already. The climb continues up to the left. No snow here but it won’t be long. Any ID on this guy? 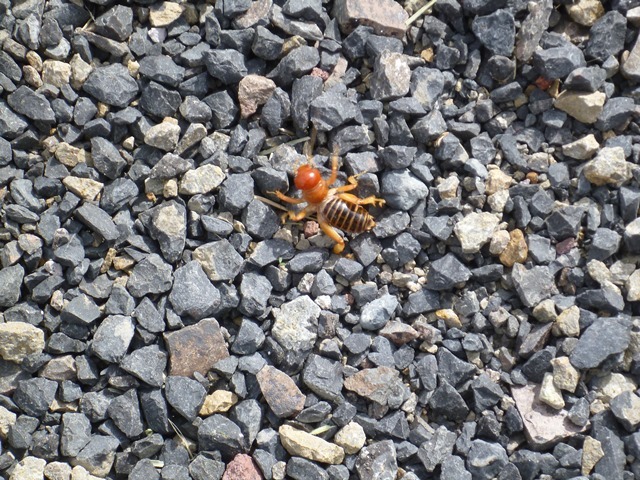 I saw lots of them crossing the roadway at different places. 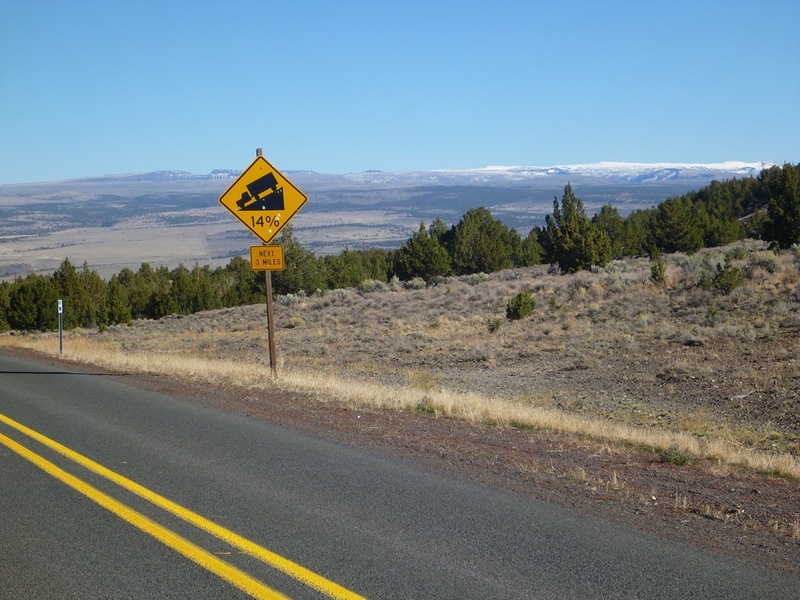 Dropping below the pass and heading south, the Steens escarpment first comes into view. Ten more miles, past Ten Cent Lake,just before Juniper Lake, while heading for Mann Lake, the gravel returns. 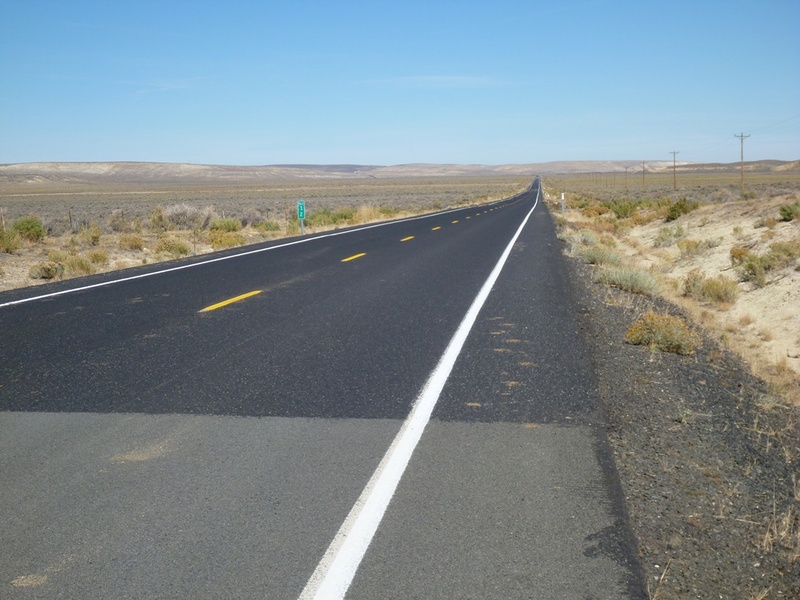 This stretch will last another 40 miles along the Alvord Desert. Now back on gravel, Mann Lake is another 13 miles or so away. My late start is now coming back to haunt me. 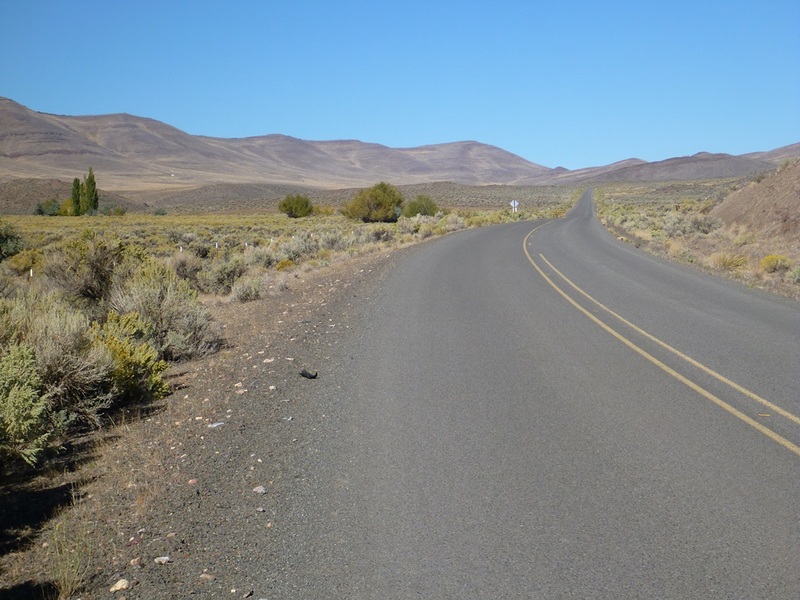 The sun is down beyond Steens, the breeze is picking back up and it’s cooling down quickly. 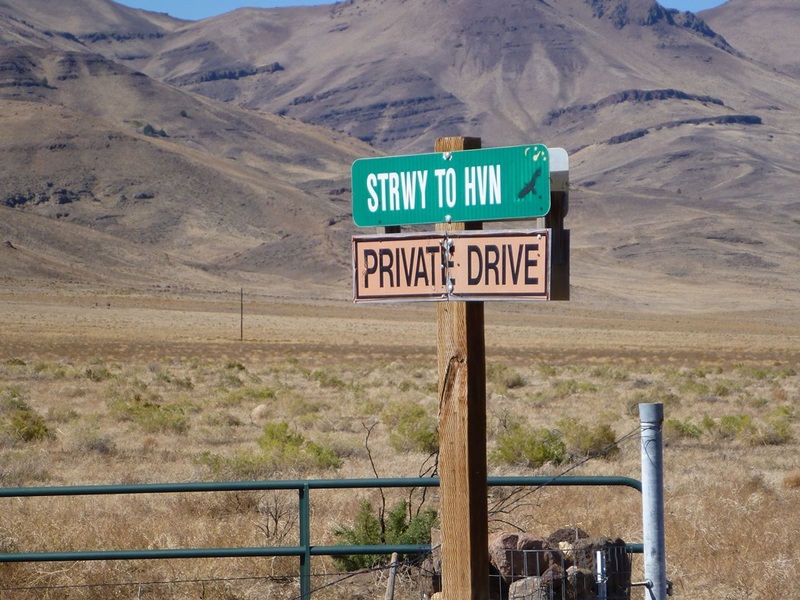 Most of the land around here is private range land and fenced off. I’m still not sure how much farther Mann Lake is but I see an unfenced area away from the road and I’m getting cold and hungry. As it begins to get dark, I get my tent set up and my dinner cooked. A beautiful sunset makes all the effort worth it. The night was a continuous serenade of coyote music! A cold night and frosty morning, the coyotes are still singing. As the sun hits Steens, the light is magic. 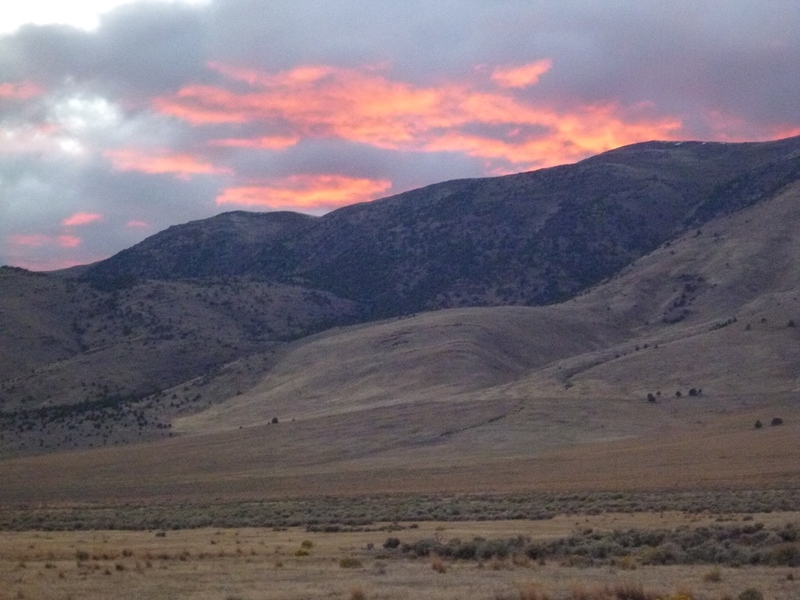 Sunrise on the edge of the Alvord Desert with Steens Mountain on the horizon. Mann Lake, as it figures, was just over a mile further down the road. My campsite was just fine and Mann Lake would have only added a vault toilet and a bit more distance from the roadway. 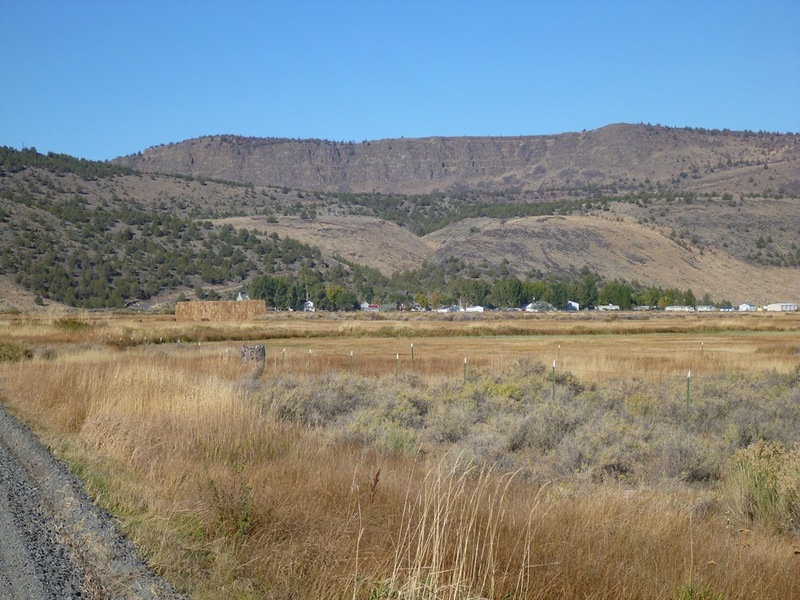 Oregon stocks the lake, a shallow alkaline body, with Lahontan trout. Mann Lake in the morning. Open despite the government shutdown! While there aren’t a huge number of vehicles on this road, they can easily be heard from over a mile away and the dust cloud is quite visible as well. Just like yesterday, most of the passing vehicles slow down and many stop to check that all is well. Thanks to all of you! 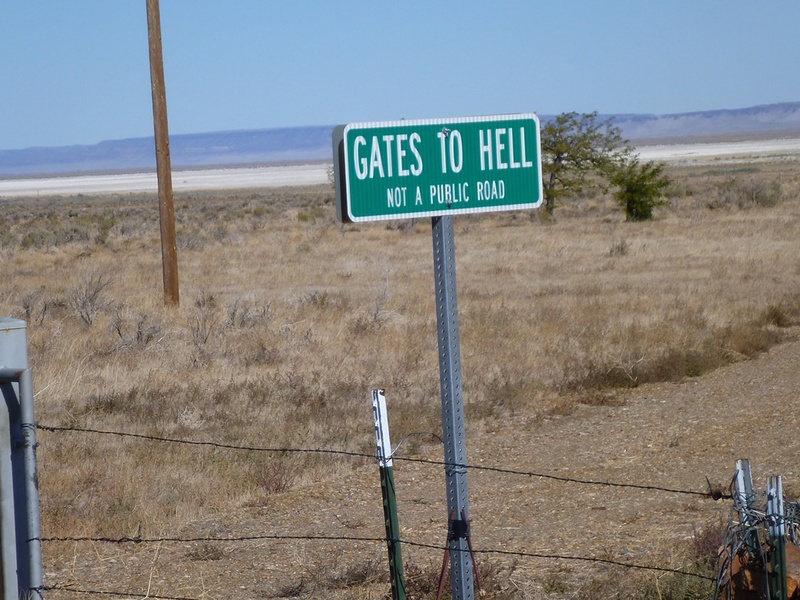 The few folks that live out here are very friendly but cherish their privacy. 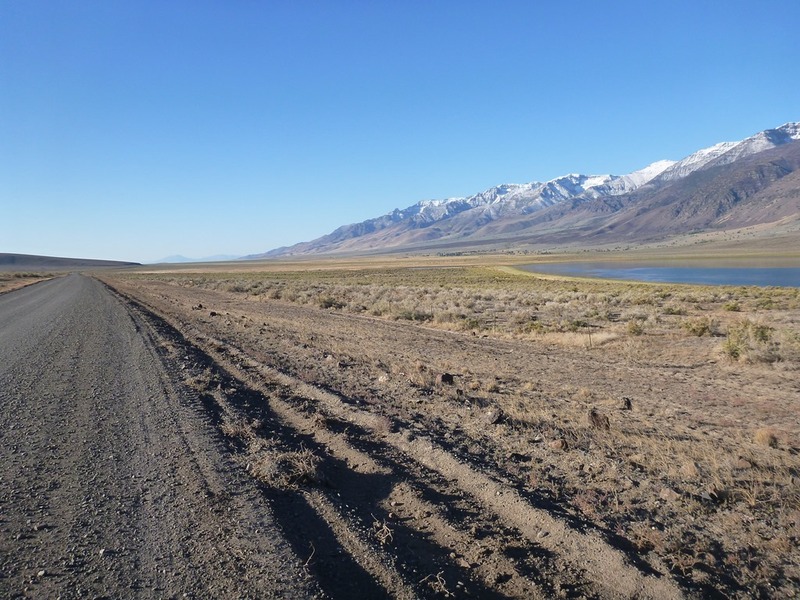 Passing a few, large ranches, the Alvord Desert begins to be noticed. 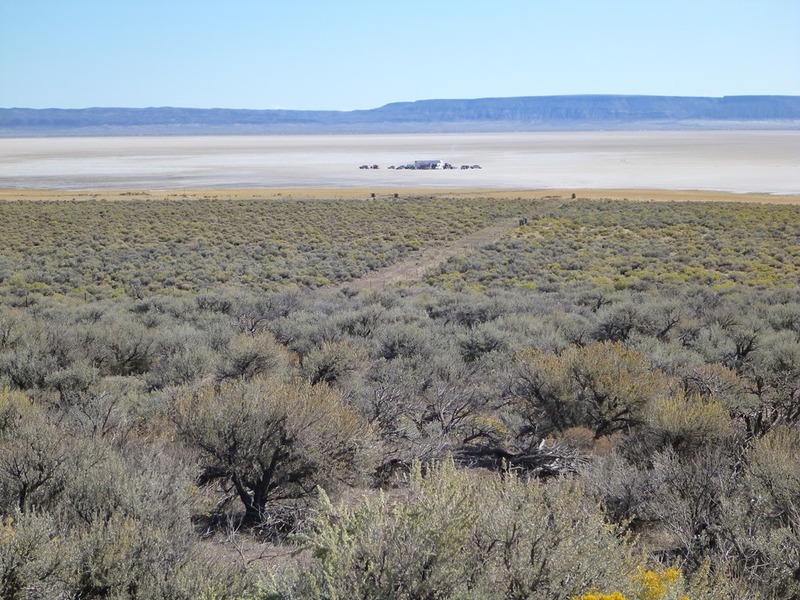 There is a group on the dried lake bed preparing for an attempt, in a few days, at the women’s land speed record. They are aiming for the 620-630 mph range!!! I wonder how she did? I knew, at some point, that the pavement would return in some form. I just didn’t expect it so soon. Approximately 13 miles before arriving in Fields, as the gravel ended, someone just happened to be parked right there. I wonder what they thought of me, on my bike, stopping to take a picture of the roadway? As I passed the turnoff to tomorrow morning’s climb, I pedaled easily down into Fields. Fields is the first water source since I left the RV park, the commerce hub of this corner of SE Oregon and NW Nevada and it has the reputation of the BEST milkshakes, anywhere! 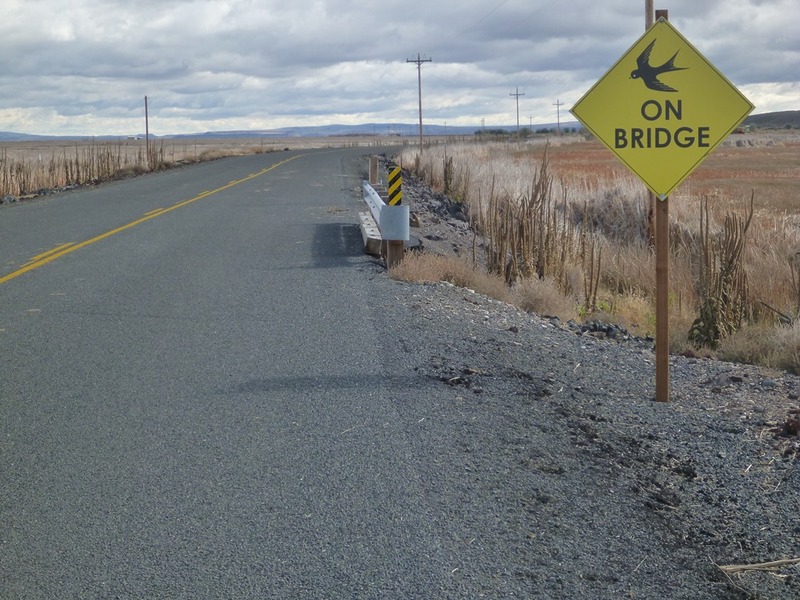 After two days of riding through the SE Oregon desert, how could I pass this by? 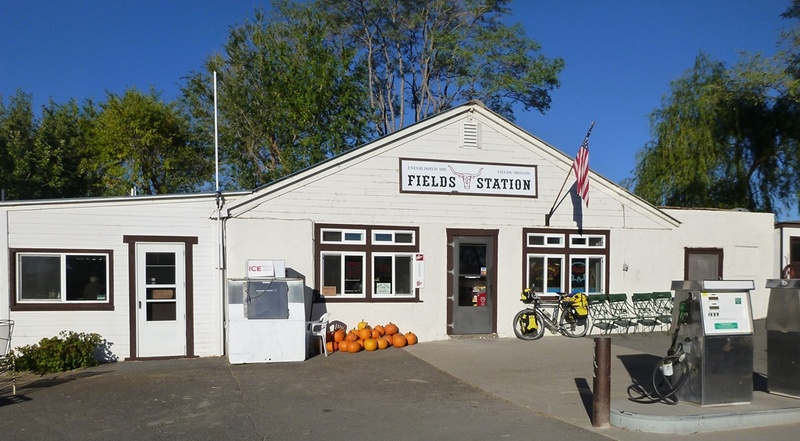 Fields Station is the local market, gas station, gravel parking lot RV site, cafe…you get the idea. 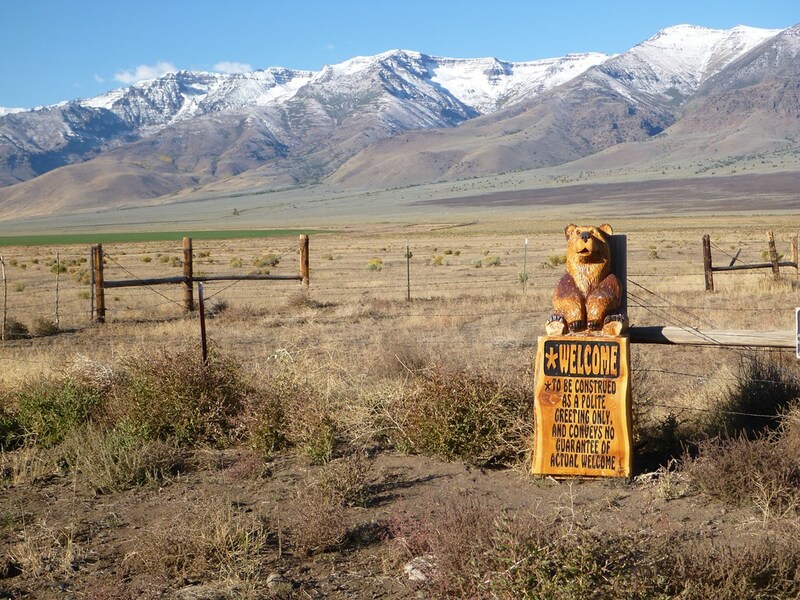 If you need something, this may be your only choice between Burns, OR and Winnemucca, NV. One word of caution, if you order a shake and ask for a straw…they may actually laugh out loud. These aren’t the nasty, runny things most places serve. These shakes are thick and delicious and REQUIRE a metal spoon to enjoy. And enjoy it you will. I actually ordered a chocolate and a strawberry shake and barely even ate any dinner! Thanks Jaide! As for accommodations, I’d also like to thank Jake for offering up the grassy yard behind the station to pitch my tent. Even the sodium vapor lamp wasn’t enough to keep me from sleeping from shortly after sundown until sunup. Morning brought early smells of bacon sizzling on the griddle. I ordered a sausage and cheese omelet, toast and tea. 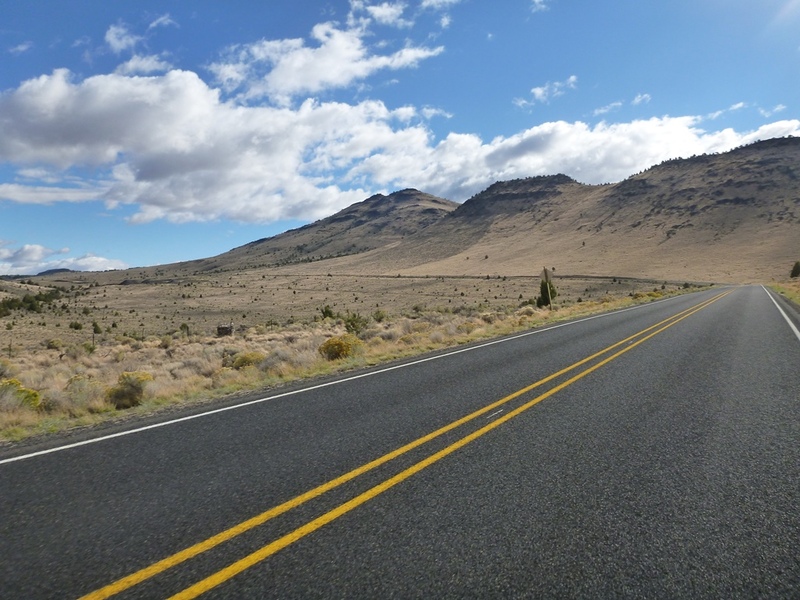 I knew I’d be starting the morning with a seven mile, 1500 foot climb from the Alvord Desert into the Catlow Valley followed by 50 miles of cruising along the valley floor. A hearty breakfast was just the ticket to power my day. The omelet and hash browns covered the entire platter-sized plate! I was only able to eat about half of it and I was completely full. What a great breakfast, Thanks again, Jake. Climbing up out of Fields was mostly a moderate (5-6%) and steady affair with a few steeper sections mixed in to keep the ego in check. 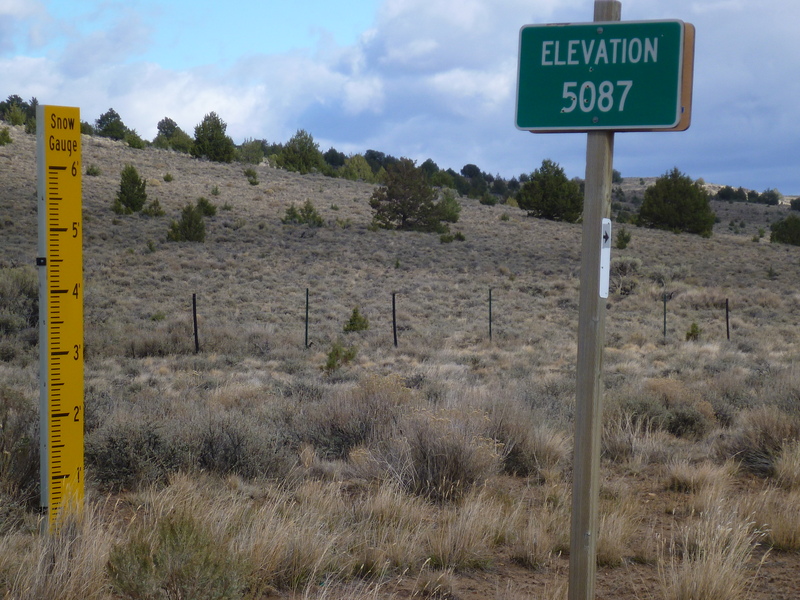 The drop into Catlow Valley was nearly identical, 7.5 miles, nearly 1000 feet. 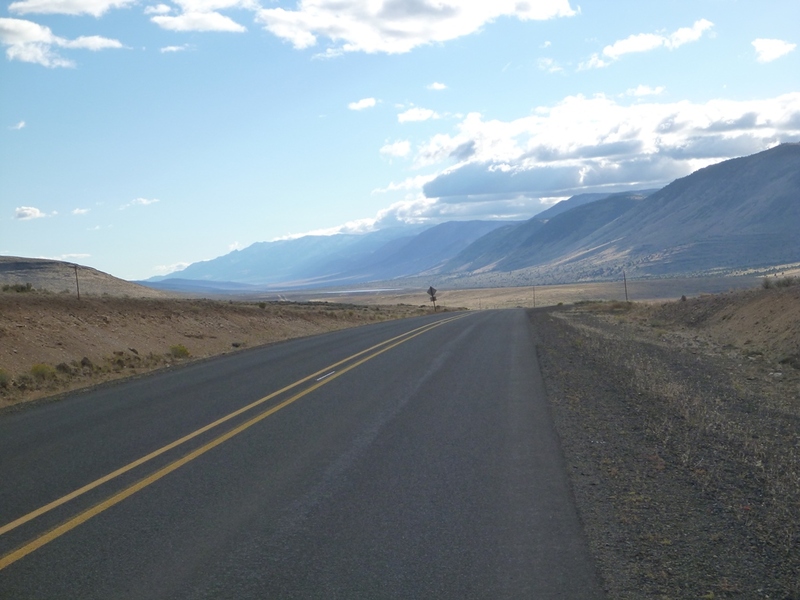 The ride north through the Catlow Valley was quiet, peaceful, wind free but lonely. 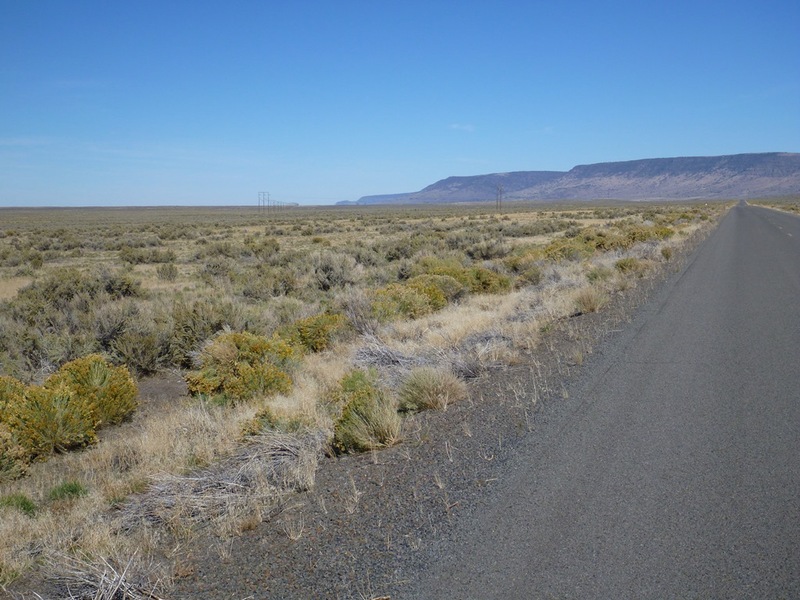 The Steens foothills are on the right as the valley extends off, seemingly forever, to the left. A single vehicle would pass every half hour or so. Other than a roadside stop for lunch and a snack or two, the remainder of the day passed with easy miles and big views. 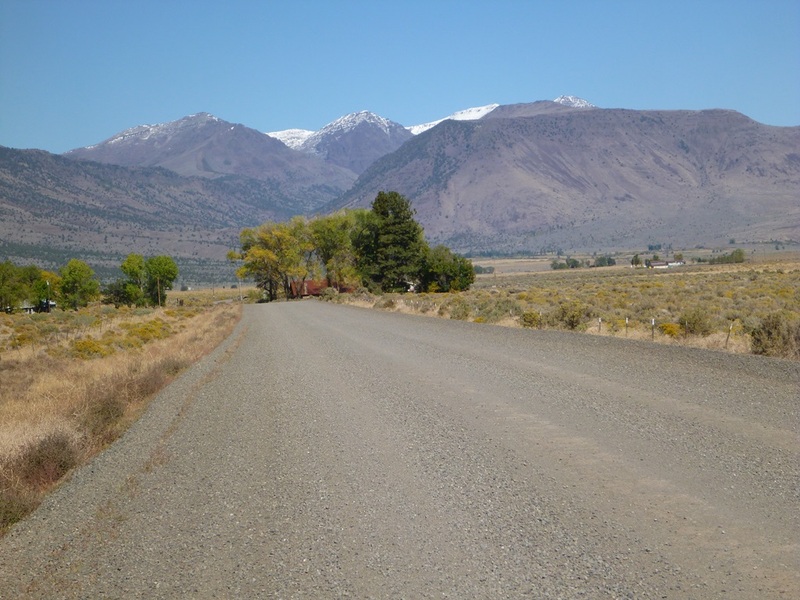 There is an established 59 mile gravel road loop beginning in Frenchglen and returning to OR 205 ten miles south of the start. I had planned on heading up from Frenchglen to spend a day or two up high and then make my way north, along the crest until it dropped back down toward Diamond. 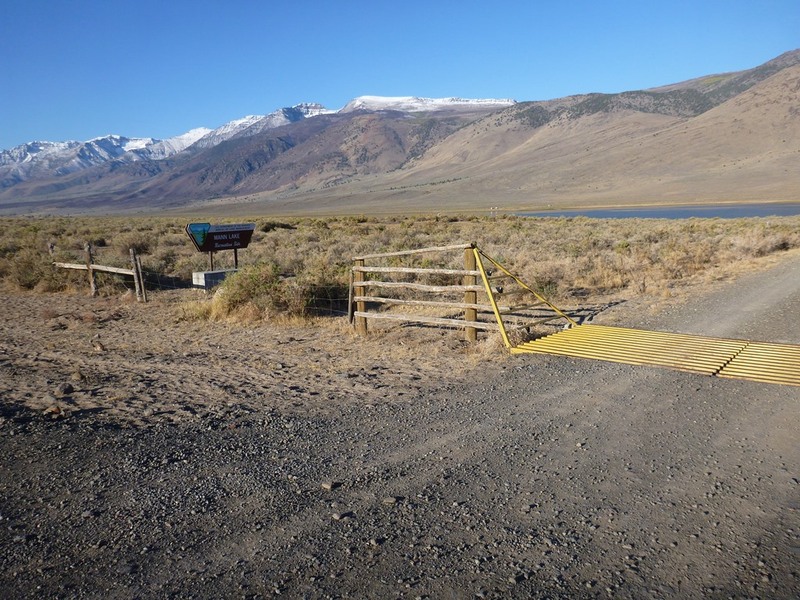 However, the week of storms that dumped lots of rain on western Oregon left a few feet of snow on the upper reaches of Steens as well. 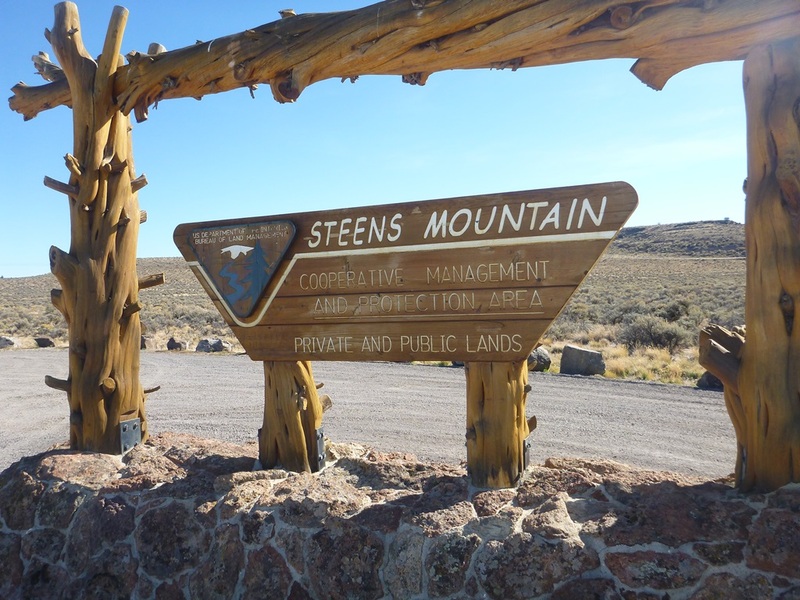 Much of Steens Mountain is protected as an early step towards possible National Monument status. 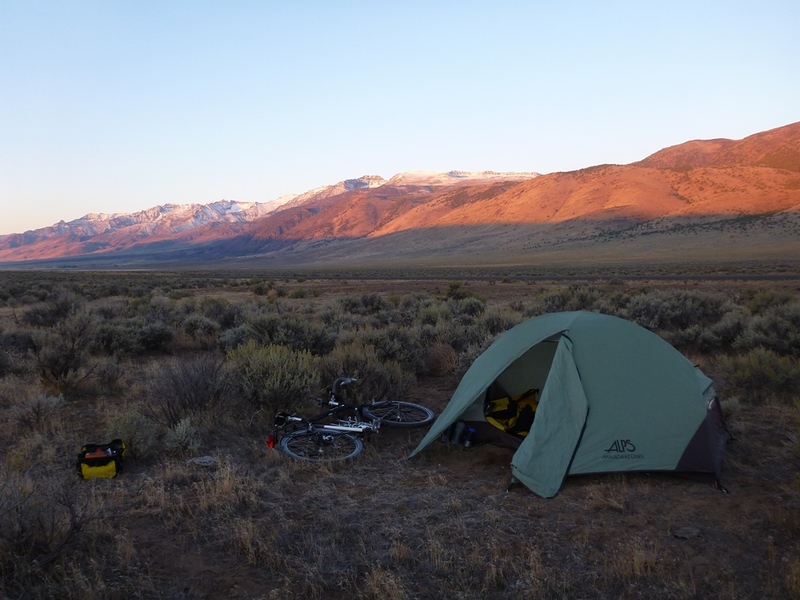 Pushing a loaded bike through unknown amounts of snow for 10+ miles, in early October, didn’t exactly appeal to me so I decided to shorten the trip a bit and spend the night camping riverside at Page Springs CG. 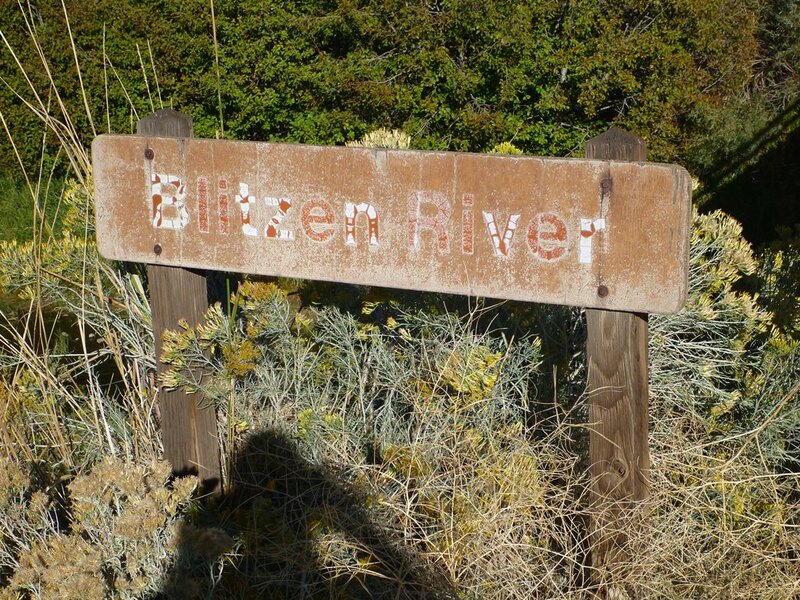 This is a BLM campground sitting on the Donner und Blitzen River with lots of potable water, shade and it wasn’t closed down! After three days of riding, a quick rinse in the ice cold river was a bonus! The final drop into Frenchglen. 14% feels right but the 3 miles was off by half, at least. 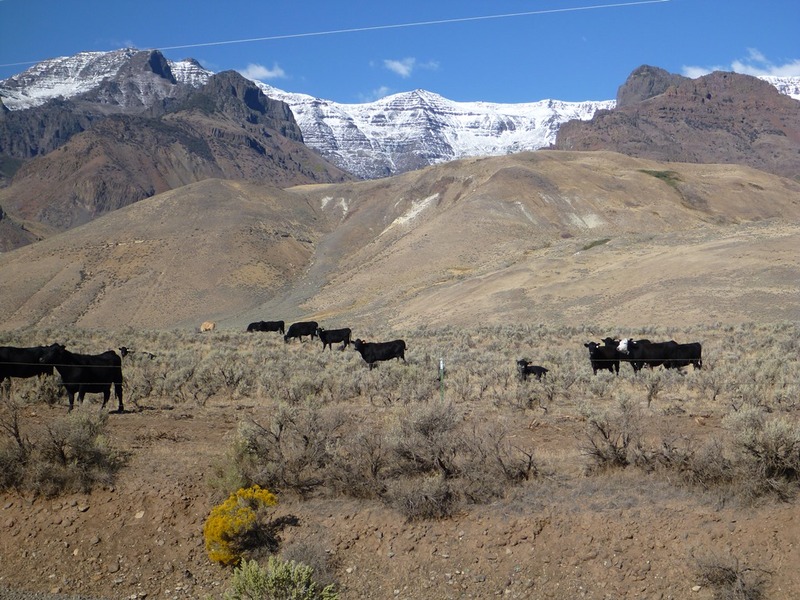 Snow on Steens’ higher reaches in the distance. I didn’t visit the Frenchglen Hotel but it comes highly recommended and, for you history buffs, it is also is an Oregon State Heritage Site. I did stop in the Frenchglen Mercantile to pickup a few items to add to my dinner. For the RVer or car camper, their selection would have been alright but, for the touring cyclist with little extra storage room, the size of the majority of selections were quite large. I knew I’d be back to my car by lunch the next day so I only needed a few snacks and a bit for dinner. Happy Anniversary JP!!! I hope you are enjoying Nepal. 12 years in the books, many more to come! Here’s to the next dozen years!!! 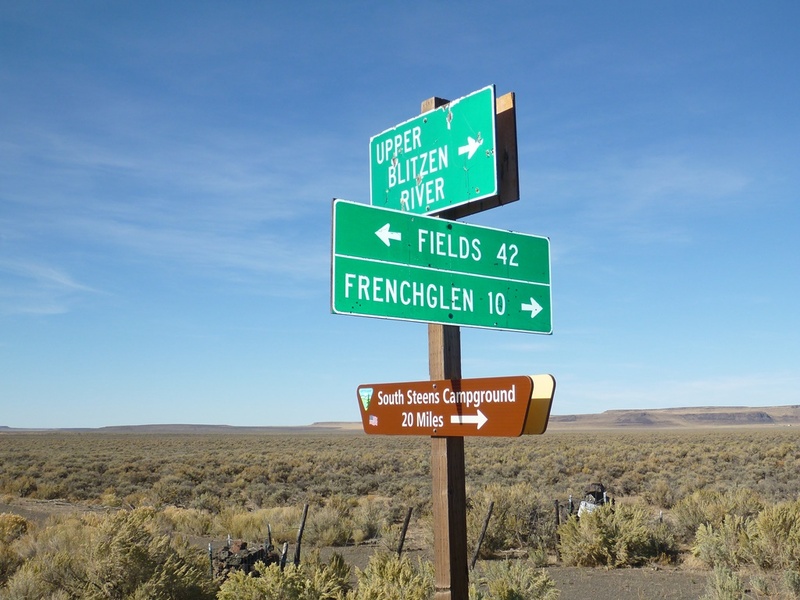 With the Steens upper elevations off the menu, today will be a short ride on OR 205 back to the RV park. Another early start and easy riding to finish the loop. Approaching Frenchglen from the campground and the final drop from yesterday afternoon. 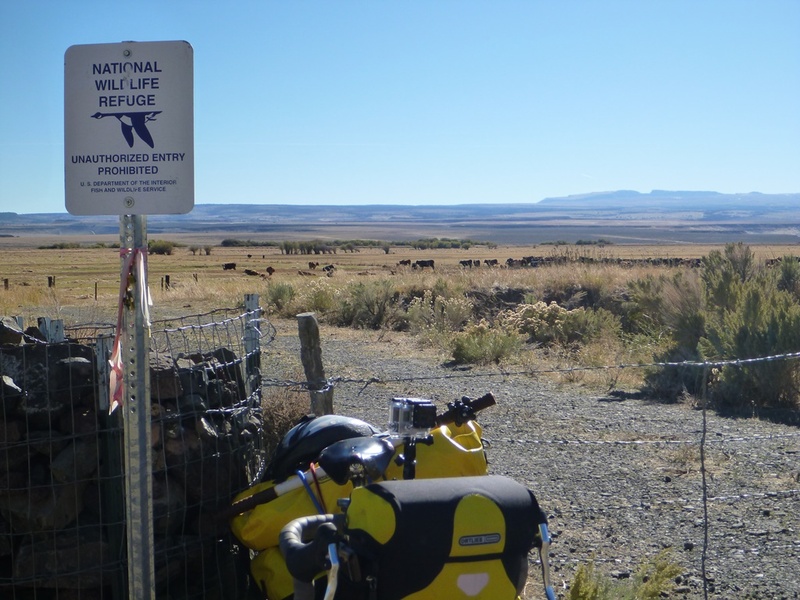 A Scenic Byway for sure! Something changed…the slight turn in the road on the horizon is nearly 6 miles away! 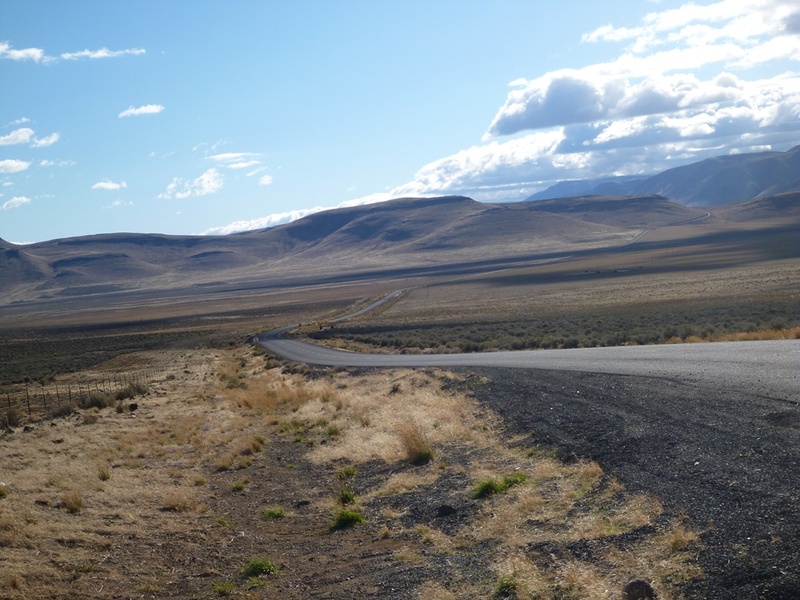 The stark beauty and impossible contrasts that make this part of Oregon so different than the rest will bring me back sometime…this time I’ll make sure Janet is also there to share the experience. I’m not really a desert person but this is truly a magical place. ← Food and Culture Through Cooking. Over the past few years, I’ve been touring and commuting on the foldable, 50 x 559 versions of Schwalbe Marathon Supremes. They provide wonderful grip on every surface I’ve tried except rocky singletrack, which is likely way beyond what they were intended to do. I’ve been able to ride 4-5,000 miles on a rear before moving the front to the rear and placing a new front tire. For the Steens trip I tested the folding Marathon Mondials in the same size. Janet wanted a tire with a bit more aggressive tread for our preferred off-pavement routes. 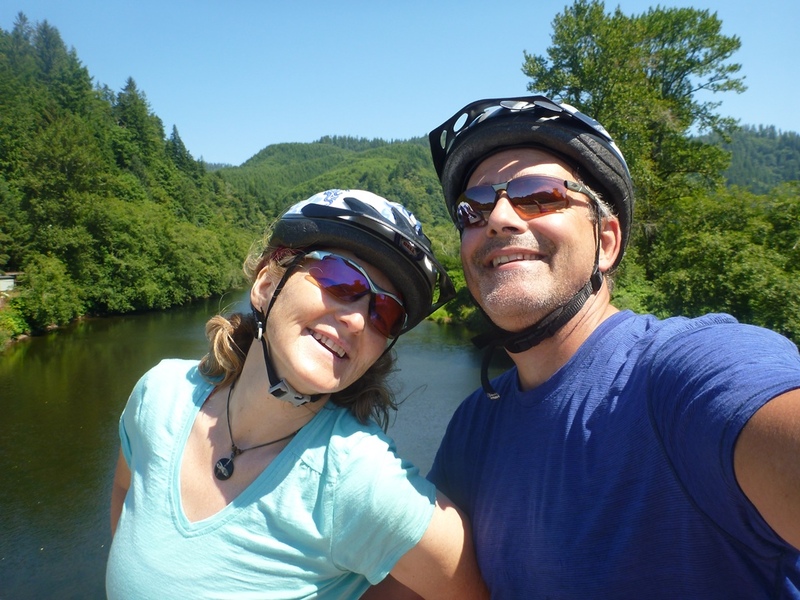 Coming from a mountain bike background, she was never entirely comfortable on relatively smooth and narrow tires off-road. On our Wales trip in 2012, I rode on the Supremes while she kept the stock 42 x 559 Continentals. Although most of that trip was paved, we had a good number of gravel and dirt miles and Janet had a number of traction issues. 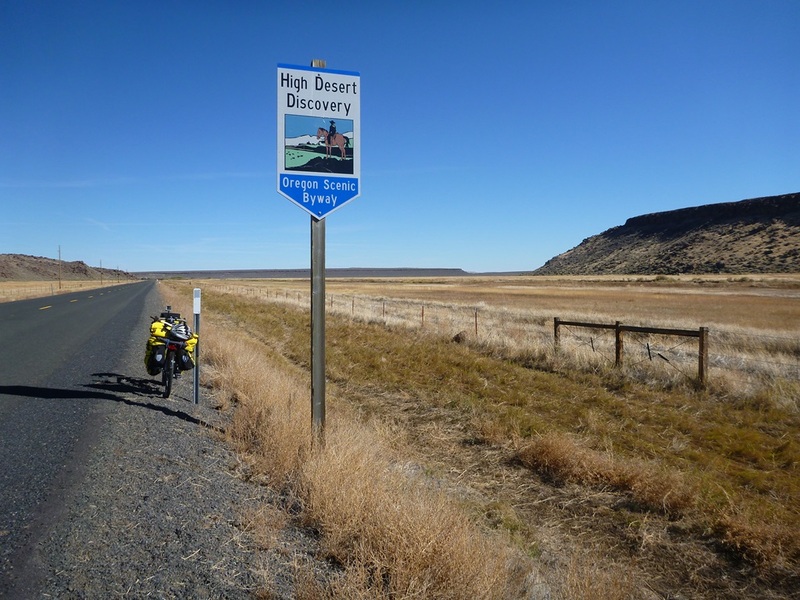 Due to an early season snowfall, my Steens trip ended up with many more paved miles and less dirt than I’d hoped for. On pavement, the tires were fairly quiet with little to no noticeable buzz while the additional traction on the remote gravel was a nice bonus. About 150 miles into the trip I did have a near failure with one of the tire casings. A 50 mm section began to delaminate causing a noticeable bubble and slight wobble while riding. It wasn’t serious enough to abandon even though the few services out there are spread out. On returning home, I contacted Schwalbe USA and sent them close-up photos to document the problem. A week later I had a new tire in my hands. I posted a very positive review of these tires on one of the many cycling forums and was immediately questioned on how I could be so positive about a tire that had a casing failure with less than 500 miles on it. My answer was simple enough… 1) it has the same casing as the Supremes, 2) I have thousands of miles of no flats and no problems on the Supremes, and 3) every mass-produced product had occasional failures. Schwalbe’s customer service was fast and efficient. Before our year-long trip I bought a second set of Mondials for Janet’s LHT and we had ZERO tire problems for the entire year…no flats, no cuts, no casing failures. We were fully loaded, sometimes over loaded, we aimed for the roads less traveled, and we didn’t shy away from exploring any off-pavement opportunity that we came across – including part of the Queen Charlotte track in New Zealand. You can find lighter, cheaper and more available tires. But for fully loaded touring in mixed terrain conditions, I love the durability and security of these tires. With well over 8,000 miles on mine, tread on the rear is still over 50% and the front looks as though it’s been only scrubbed a bit.